The explosion of Oberhauser lair in the film is very impressive, even more so when you realise that there is no CGI used to create the shot of the explosion and Bond and Swann. The explosion is completely real and James Bond (Daniel Craig) and Madeleine Swann (Léa Seydoux) are actually there watching the explosion. Producer Barbara Broccoli, Daniel Craig and Léa Seydoux, accepted the record certificate in Beijing, China on behalf of winner Chris Corbould, who served as Special Effects and Miniature Effects Supervisor on SPECTRE. 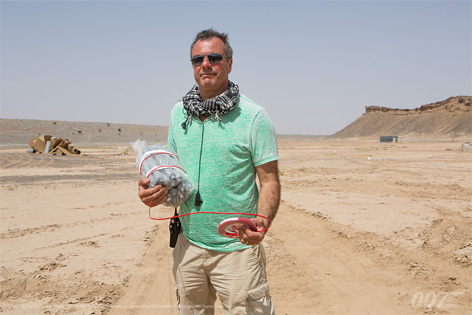 Commenting on the announcement, Michael G. Wilson and Barbara Broccoli, the producers of SPECTRE, said, “It is absolutely tremendous that the Guinness World Records have recognised Chris Corbould’s incredible work in SPECTRE in which he created the largest explosion ever in film history." Guinness World Records editor-in-chief Craig Glenday added: "The James Bond movies are synonymous with pushing cinematic boundaries. The scene featuring the world's largest film stunt explosion is spectacular and will live long in the memory as one of the outstanding moments in the Bond franchise." Well done Mr Craig and the rest of the cast and crew, a brilliant movie, well done.